This major new international anthology celebrates the work of women of African descent, captures their continuing contributions, and charts a contemporary literary landscape as never before. 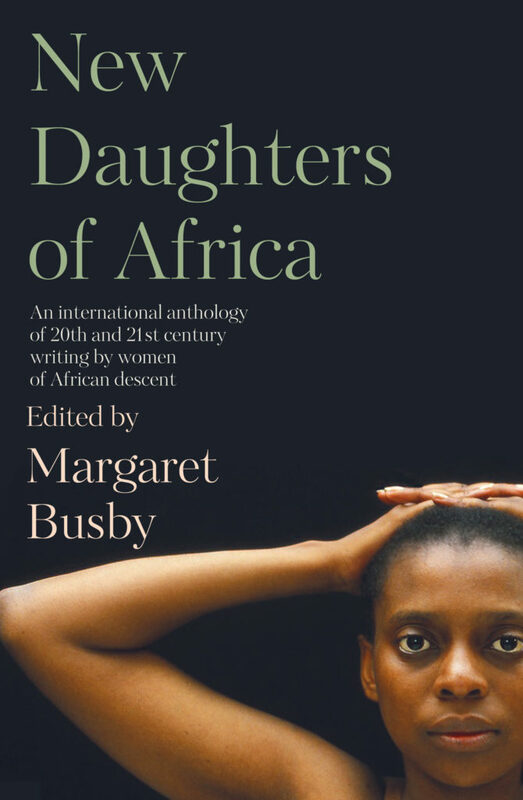 Following up Margaret Busby’s landmark 1992 anthology Daughters of Africa, this companion volume brings together the words of writers from across the globe—Antigua to Zimbabwe, Angola to the USA—to honour a unifying heritage while showing the remarkable range of creativity from the African diaspora particularly in the past 25 years. Arranged chronologically, New Daughters of Africa illustrates an uplifting sense of sisterhood and the links that endure from generation to generation, as well as common obstacles writers still negotiate around issues of race, gender and class. Yassmin Abdel-Magied • #LeilaAboulela • #AyobamiAdebayo • Sade Adeniran • #ChimamandaNgoziAdichie • Zoe Adjonyoh • Patience Agbabi • Candace Allen • Lisa Allen-Agostini • Ellah Wakatama Allfrey • Harriet Anena • Joan Anim-Addo • Monica Arac de Nyeko • Yemisi Aribisala • Yolanda Arroyo Pizarro • Amma Asante • Ayesha Harruna Attah • Michelle Yaa Asantewa • Sefi Atta • Ayesha Harruna Attah • Gabeba Baderoon • Yaba Badoe • Yvonne Bailey-Smith • Doreen Baingana • Ellen Banda-Aaku • Angela Barry • Mildred Barya • Jackee Budesta Batanda • Simi Bedford • Jay Bernard • Marion Bethel • Rhoda Bharath • Ama Biney • Jacqueline Bishop • Malorie Blackman • Tanella Boni • Malika Booker • Beverley Bryan • Akosua Busia • Candice Carty-Williams • Panashe Chigumadzi • Gabrielle Civil • Maxine Beneba Clarke • #CarolynCooper • Patricia Cumper • Stella Dadzie • Yrsa Daley-Ward • Nana-Ama Danquah • Edwidge Danticat • Nadia Davids • Tjawangwa Dema • Yvonne Denis Rosario • Nah Dove • Edwige Renée Dro • Camille Dungy • Anaïs Duplan • #ReniEddo-Lodge • Aida Edemariam • Esi Edugyan • Summer Edward • Yvvette Edwards • #ZenaEdwards • Safia Elhillo • Zetta Elliott • Nawal El Saadawi • Diana Evans • Bernardine Evaristo • Eve Ewing • Diana Ferrus • Nikki Finney • Aminatta Forna • Ifeona Fulani • Vangile Gantsho • Petina Gappah • Roxane Gay • Danielle Legros Georges • Patricia Glinton-Meicholas • Hawa Jande Golakai • Wangui wa Goro • Bonnie Greer • Jane Grell • Carmen Harris • #AfuaHirsch • Zita Holbourne • Nalo Hopkinson • Rashidah Ismaili • Delia Jarrett-Macauley • Margo Jefferson • Barbara Jenkins • Catherine Johnson • Ethel Irene Kabwato • Donika Kelly • Adrienne Kennedy • Susan Nalugwa Kiguli • Rosamond King • #LauriKubuitsile • Goretti Kyomuhendo • Beatrice Lamwaka • Patrice Lawrence • Andrea Levy • Lesley Lokko • Karen Lord • Ashley Makue • Jennifer Nansubuga Makumbi • Sarah Ladipo Manyika • Ros Martin • Barbara Masekela • Lebogang Mashile • Nomavenda Mathiane • Kopano Matlwa • Imbolo Mbue • Karen McCarthy Woolf • Maaza Mengiste • Bridget Minamore • Nadifa Mohamed • Natalia Molebatsi • Wame Molefhe • Aja Monet • Bethany C. Morrow • Sisonke Msimang • Blessing Musariri • Glaydah Namukasa • Juliana Makuchi Nfah-Abbenyi • Wanjiku wa Ngugi • Ketty Nivyabandia • Deise Nunes • Elizabeth Nunez • Selina Nwulu • Nana Oforiatta-Ayim • Irenosen Okojie • Nnedi Okorafor • Chinelo Okparanta • Yewande Omotoso • Makena Onjerika • Chibundu Onuzo • Osonye Tess Onwueme • Yvonne Adhiambo Owuor • Djaimilia Pereira de Almeida • Alake Pilgrim • Winsome Pinnock • Hannah Pool • #OlumidePopoola • Zandria F. Robinson • Zuleica Romay • Leone Ross • Minna Salami • Marina Salandy-Brown • Sapphire • Noo Saro-Wiwa • Suzanne Scafe • Taiye Selasi • Namwali Serpell • #KadijaSesay • Verene Shepherd • Warsan Shire • Lola Shoneyin • Dorothea Smartt • #ZadieSmith • #AdeSolanke • Celia Sorhaindo • Andrea Stuart • SuAndi • Valerie Tagwira • Jennifer Teege • Jean Thévenet • Novuyo Rosa Tshuma • Chika Unigwe • Yvonne Vera • #PhillippaYaadeVilliers • Kit de Waal • Elizabeth Walcott-Hackshaw • Ayeta Anne Wangusa • Zukiswa Wanner • Verna Wilkins • Charlotte Williams • Sue Woodford-Hollick • Makhosazana Xaba • #TiphanieYanique.